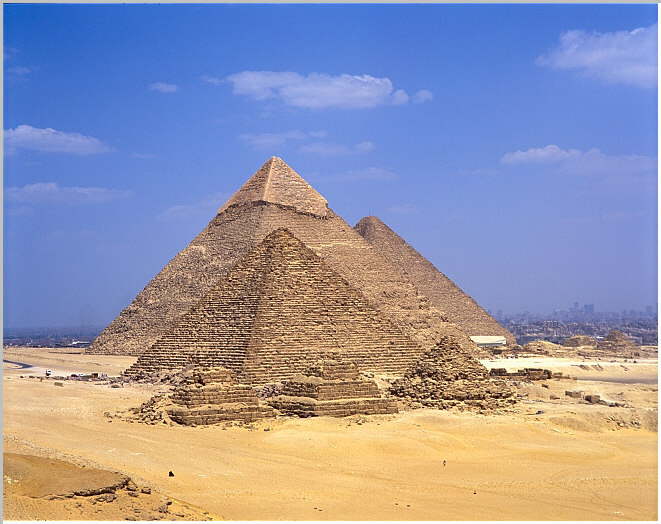 The Giza Plateau is situated on the west side of Cairo city. There are 11 pyramids in all including the Great Pyramid of Khufu, visible in the background. This view is from the desert 2.5km south of the plateau. Cairo is visible in the background. The city is beginning to engulf the pyramids and in due course the pyramids may find themselves in the middle of a great city. In the foreground are the secondary pyramids of Menkaure. Followed in the rear by the the pyramids of Khafre and Khufu. In the far background to the right are the 4 secondary pyramids of Khufu.